Law enforcement agencies throughout San Diego County warned Thursday of the dangers of alcohol- and drug-impaired driving over the long July 4 weekend amid increased fatalities. 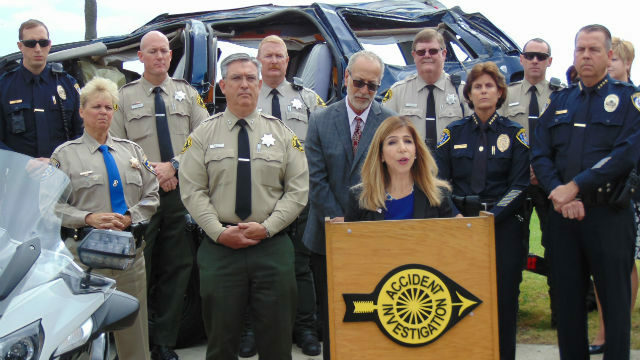 “A simple plan at the beginning of the night can prevent devastation at the end,” said interim District Attorney Summer Stephan. Agencies plan saturation patrols, extra staffing and at least four checkpoints during the four-day holiday weekend. Stephan, Zimmerman and Asst. Sheriff Michael Barnett were joined by officers from Chula Vista, Escondido, Oceanside and the California Highway Patrol at a press conference on Mission Bay. Barnett said drugs are increasingly a factor in impaired-driving accidents, with double the number of arrests so far in 2017. “Driving while impaired by drugs is illegal and just as dangerous as driving under the influence of alcohol,” he said.